A-1 Asphalt Inc. Sealing and Repair Corporation was founded in 1988. The new company began by providing asphalt repairs and sealcoating services for residential, commercial and institutional customers. The focus was later expanded to include municipal customers. Today the company offers one of the most comprehensive asphalt maintenance programs in the Grand Rapids, Mich., area. 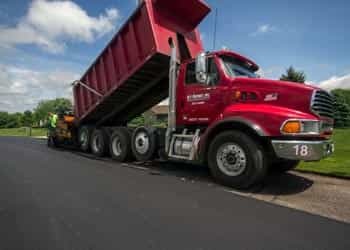 It is through cost containment and the introduction of new techniques that the company has been able to position itself as a leader in the asphalt industry. In addition to maintenance, A-1 has grown to offer a full line of removal, grading and paving services complemented by our half lane Wirtgen mill machine. We have the capacity to successfully tackle any project! In the last several years, Team A-1 has begun to focus on project management. We will handle excavation, grading, paving, cement work, striping, bumper blocks, and most related services. Do not really want to deal with the headache? Give us the plans and let our capable and experienced project managers handle it for you! For more information on how A-1 Asphalt Inc’s professional asphalt paving contractors can help you with your next project, contact us today or call us directly at (800) 871-4401. We proudly serve Grand Rapids, Kalamazoo and the entire West Michigan area.